Although device and software maker BlackBerry has fallen on hard times, it’s long been thought the company may carve a niche for itself in the automotive software space. So it was unsurprising when the company revealed this week that it has sold its European research and development centre in Bochum, Germany, to local auto firm Volkswagen. The car manufacturer has formed a new unit, Volkswagen Infotainment, with the objective of interlinking vehicles and the surrounding world, looking at new strategies and innovations that are needed in order to better interlink driver and automobile with the infrastructure. “The exchange of information between vehicle and mobile devices, such as MP3 players, smart phones and car keys, is already taking place today. In the near future further forms of communication will become equally established: communication between vehicle and the driver’s home or office; communication between vehicle and filling stations, parking spaces and road infrastructure (car-to-X communication); and ultimately also from vehicle to vehicle (car-to-car communication),” Volkswagen said. According to Dr. Heinz-Jakob Neußer, Member of the Board of Management Volkswagen Brand for the Development Division, connectivity will be a key feature of the car of the future and many customers are expecting connected vehicles of a new dimension in terms of convenience and road safety. The number of in-vehicle apps in use is expected to reach 269 million by 2018 according to a report published earlier this week by Juniper Research, representing a more than fivefold increase on last year’s figure. Anthony Cox, associate analyst at Juniper Research and author of the report told Business Cloud News that while the business model leaves much to be developed, those that stand to gain most are telcos and cloud service providers. The report found that the integration of apps into the vehicle will have a profound effect on traditional monetisation models, potentially denting revenues for existing telematics service providers. 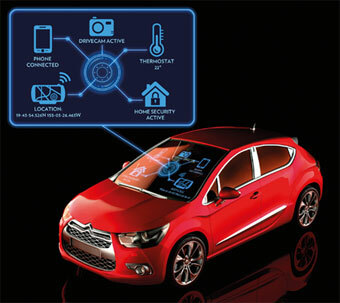 Despite a combination of regulations and industry initiatives combining to ensure embedded telematics won’t necessarily disappear (regulatory measures forcing vehicle OEMs to embed anti-theft systems in their cars, for instance), widespread smartphone tethering and in-vehicle apps will continue to drive down the price of vehicle manufacturers’ own embedded telematics infotainment services. Previous: One-fifth of all websites blocked in the U.K.